You guys, Terry has a new book coming out! 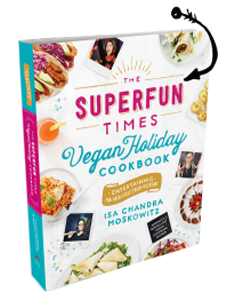 It’s called “Vegan Eats World” and it’s 300 international-inspired recipes. It’s out on October 30th but ready for pre-order now. This book is hardcover and full-color and errything, and I’m going to share a few recipes with you over the next week or so. Last month on the Post Punk Kitchen facebook, we were talking soups and stews, and someone was reminiscing about a Ukranian sauerkraut soup they grew up with. I remembered that Terry had a recipe for it, so I thought that this would be the perfect one to start with. OK, now Imma let Terry take it away! ~For the sauerkraut, shun the lifeless canned stuff in favor of the high-quality ’kraut sold in jars or plastic bags in the refrigerated section; even better, buy it in bulk (usually stocked in big barrels) in some Kosher or Eastern European markets. ~You’ll be using the juice so be sure to set some aside! Slice mushroom caps in half, then slice the caps into quarters to create bite-size mushroom pieces. In a 4-quart soup pot over medium-high heat, sauté the leek, carrot, and celery in vegetable oil for 6 minutes. Stir in garlic and mushrooms and sauté for another 6 to 8 minutes, or until mushrooms have reduced in size and released most of their liquid. Pour in the wine and simmer for 2 minutes, then stir in parsnip, vegetable broth, bay leaves, allspice, caraway seeds (if using), marjoram, sauerkraut, sauerkraut juice, and ground black pepper. Increase heat and bring to a gentle boil, then reduce heat, stir occasionally and cover. Simmer the soup for 35 to 40 minutes or until the parsnips are tender. Remove the bay leaves, turn off the heat and season with cracked black pepper and salt if necessary and garnish with parsley. Allow soup to cool 5 minutes before serving. Top each bowlful with a generous tablespoon of vegan sour cream. So happy this recipe was shared! I was a tester and this was my favourite recipe from teh entire cookbook! Yum! OOoh. Can’t wait to try this! Sounds delectable! Definitely making this tonight. I’ll let you know how it goes! I’m super stoked! Testing for this book was so fun! I’m anxiously awaiting my copy. I think my favorite thing about you two is your fearlessness. You’re not afraid to admit you’re whipping it up as you go, nor to provide a long (long, long) list of ingredients to recreate what you made. Have at and rock on. Web Feast Friday: Vegan Mofo 2012 « Eat.Plants.Live. I have a batch of homemade kraut in my fridge right now–and now I know what I’m going to do with it next! Hooray! Wow, thanks for sharing… I am thrilled! I grew up in the Black Forest, Germany (living in Israel today) and must say that every year I feel a longing for sauerkraut as soon as the first rain comes… I love Mediterranean autumn with its pomgranates, but this week I am going to check out some Russian shops for Sauerkraut. You totally inspired me, Isa and Terry! Hi! We’re a couple of Italian vegan foodbloggers. We’ve just discovered your blog and your amazing recipes… Wow! Thanks a lot for sharing such good information :-). Beautiful photograph, intriguing recipe, and thank you for the lovely vegan stew! This is on this week’s list of recipes, and the ingredients are on my grocery list. Thank you! Yesss! Thanks a bunch lady! Damn it! I just went to the grocery store specifically to get all the ingredients for this soup and I forgot to pick up a leek!! Do you think a sweet onion would be an acceptable substitute or should I just wait till tomorrow and do this right? I’ve wanted to make Shchi since Russian class in 2005. I’m glad I waited for Terry’s recipe! It made for a lovely dinner yesterday, perfect for cold weather! The caraway seeds inspired me to make bread with caraway seeds on top. Great for dipping! Thank you Terry! I just finished making this soup, and it did not disappoint! The flavours are very unique and i’m glad I tried something “different.” The way the quartered mushrooms float at the top reminds me of an Asian pot, but the flavours and aromas filling the kitchen are very European. The sauerkraut and caraway remind me of when my grandmother made cabbage rolls and Finnish caraway rye bread; so familiar and comforting. Delicious broth, and very hearty. 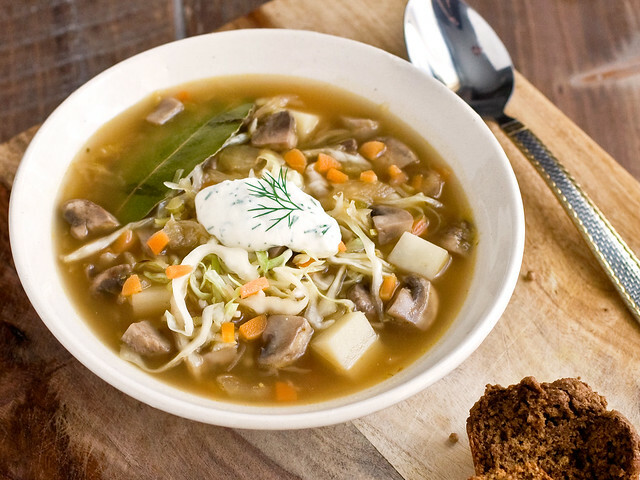 A super-healthy, hearty autumn/winter meal, and a wonderful soup for an immunity boost! Yay! I just started a batch of homemade sauerkraut and I will definitely be making this soup when it’s ready! Woop woop! Deffo buying terrys new book. Cant wait to try this. Also to get some ukranian rye bread to gp witj it. One of the best soups I’ve ever made! Thanks for sharing. I will definitely be getting this book This soup was Delicious! Instead of just parsnips or just potatoes, I used a cup of both. Curious…how do you think turnips would fly in this as a sub for parsnips? I have potatoes, too, but would rather use up a few turnips! Ethiopian Lentils in Berbere Sauce (Yemiser W’et) (& Vegan Eats World review) « the taste space – steam, bake, boil, shake! Just finished eating my first bowl – yum! Sadly, I used up my parsnips yesterday in another soup, so had to settle for taters, but my homemade sauerkraut was pungent enough to make up for the relative blandness of the tuber. Oh my goodness! I am just seeing this now! I am that person who reminisced about the Ukranian Sauerkraut soup! Thank you so much: I am making it very soon!!!!!! Thank you for listening!!! I loved this soup. I think it might even be my favorite soup, ever. It was a great way to use some of my homemade sauerkraut. I used parsnips and caraway, but forgot the bay leaves. I think most root veggies would go well in this soup. I made this soup yesterday and let it sit over night and it was even better. Great recipe and will make it again. I would like to know what the calorie count is per cup as I am on a diet. I have lost 115 pounds and I know this will be on my diet and be within the 1500 calories I am allowed each day. Thanks for the recipe. On my list to make again. It is soooooo good.